Fertility treatment is a concentrated achievement that requires sensitivity and an understanding of the physical and emotional aspects of a patient’s fertility issues. Our world-class euroCARE IVF medical team provides sophisticated reproductive technology services. Our clinical growth has been the result of a supportive and personalized approach to fertility care. 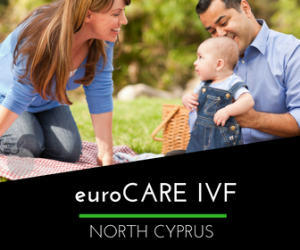 Mini IVF (Minimal Stimulation IVF) in North Cyprus is an innovative, dramatically lower-costing treatment option. Mini IVF is a popular fertility treatment that enables women to undergo in-vitro fertilization (IVF) without a voluminous amount of fertility drugs. In a normal IVF procedure, patients are administered follicle stimulating hormones to stimulate their bodies into producing more eggs than normal. Mini IVF differs from Natural Cycle IVF as the treatment uses a minimal amount of medication to stimulate the ovaries so they produce the maximum number of ‘quality’ eggs in a single cycle. Our goal at the top fertility clinic in North Cyprus is to accommodate all cases of infertility. Whether a patient has a previous medical condition that prevents her from utilizing hormonal stimulation, or she simply does not want to use hormonal medications, patients can still undergo fertility treatment at euroCARE IVF. Where the hormones from a regular IVF procedure are intended to increase the quantity of eggs in the uterus, the fewer hormones used in Mini IVF are designed to increase the quality of eggs. Our expert fertility specialists, Dr. Armağan Ulubaş, may recommend Mini IVF for older patients with high FSH levels and lowered ovarian reserves. Mini IVF treatment at eurocARE IVF will follow the same general process as conventional IVF treatment whereas tests are needed for the Doctor to confirm the best treatment plan and the medication is then organized. The treatment cycle is dependent on the monthly menstruation cycle. Low dose medication is administered as advised by the Doctor and the egg growth is then monitored with regular scans. When the eggs are ready, the trigger injection is required to initiate the final stages of the eggs maturation in the ovaries. Then, 36 hours later the eggs are collected by aspiration under ultrasound guidance. The eggs are then fertilized with the sperm using the ICSI procedure. The resulting embryos are then closely monitored by our expert embryologist. When the embryos are at their best development stage the transfer procedure is carried out, typically on day 3 or 5 of their development. Is Mini IVF The Right Choice For Me? The Mini IVF cycle does have its benefits, as it will keep the costs down since less medication is prescribed to stimulate the eggs development. There is also less risk of developing OHSS (ovarian hyperstimulation syndrome), which can sometimes occur with a standard IVF cycle. While a Mini IVF cycle has a higher chance of success than a Natural IVF cycle (no medication is used), it does tend to have a lower chance of success than the standard IVF treatment cycle. Since it uses a low dose medication and a smaller number of eggs develop than with a standard IVF cycle, fewer eggs can mean a lower chance of success. There is is always the risk that no eggs will be retrieved at all and the treatment cycle would be cancelled. With fewer eggs collected then it is unlikely that there will be remaining embryos to freeze. With a standard IVF cycle there is often the option to freeze those embryos that are not transferred and so giving the option for a second attempt without repeating the full stimulation procedure all over again or trying for a sibling in the future. Mini-IVF is suitable if a woman cannot or does not want to take a higher dose of medication or for women who wish to keep the costs to a minimum. However, this route may cost more in the long run if more cycles are required for example. Our expert fertility specialists at euroCARE will be able to advise you if a Mini-IVF cycle is a suitable option and will be happy to answer any questions you have about the treatment. euroCARE IVF is committed to providing every patient with the best fertility experience, tailored treatment plans, compassionate patient-centered care and advanced technologies.